Looks like LivingSocial is employing the same strategy for international expansion as its rival Groupon: by acquiring local daily deal sites to serve as a foundation for discount distribution on a global scale. According to DailySocial, the company has moved to purchase DealKeren (operational in Indonesia), its parent company Ensogo (which offers daily deals in Thailand and the Philippines) as well as GoNabit (which operates in Dubai, Abu Dhabi, Lebanon, Jordan and Kuwait). LivingSocial hasn’t (yet) formally announced the acquisitions, but the report is corroborated by news site CPI Financial (although the article, which you can find using Google News, is unavailable at this moment). 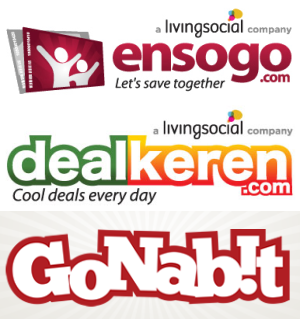 Clearly, the fresh logos confirm the purchases of Ensogo and DealKeren (but not GoNabit). We have no knowledge of the terms of the deals, but we’ll update as soon as we learn more. WASHINGTON, June 27, 2011 /PRNewswire/ — LivingSocial, the online source for handpicked experiences at a great value, today announced it has acquired Ensogo, the market-leading deal site in Thailand and the Philippines; DealKeren, an Ensogo company based in Indonesia; and GoNabit, a daily deal pioneer with a presence in four Middle Eastern countries. LivingSocial also introduced Daily Deals in the Netherlands. GoNabit was co-founded by Dan Stuart and Sohrab Jahanbani in January 2010 and is currently the leading daily deal provider based in United Arab Emirates. The site also presents mom- and dad-approved offers, suitable for children and parents alike, with Dubai Family, as well as travel-specific deals through GoNabit Getaways. In addition to being the first group-buying site in the Middle East/North Africa, GoNabit is the first company of its kind to offer deals in Arabic. Members in Abu Dhabi, Amman, Dubai, Beirut, Cairo and Sharjah Ajman have saved more than $5 million USD in the past year.